When your ship docks in Oslo's port, take a comprehensive tour of the city's highlights with this 4-hour shore excursion. Combine a walking tour with an express route on a sightseeing bus that allows you to take in landmarks such as the Viking Museum, the Vigeland Installation in Frogner Park, and others. Admission to all attractions and round-trip transportation from the port are included. When your ship docks in Oslo, meet your tour guide for a short orientation before departing on a 4-hour, whirlwind tour of Oslo's highlights. First, take a coach sightseeing tour along the Oslo fjord waterfront. Disembark at the Oslo Opera & Ballet, where you can climb to the rooftop to get panoramic views over the city. Continue to Karl Johans Gate, home to the Norwegian Royal Palace, Parliament, the University, the National Theatre, and City Hall. Step inside the City Hall building, home to the Nobel Peace Prize ceremony. Stroll through the installation at the Vigeland sculpture park, then head over to the lush, green Bygdøy peninsula. See the thousand-year-old Viking ships, surrounded by hilltops and fjords, before heading back to the cruise port for drop-off. 03:45-04:00 Return to cruise port. The Viking Ship Museum was pretty much what we expected and we are glad we went. However...Drum Roll...Vigeland Park was totally beyond amazing! In June, the crowds were pretty intimidating, but our guide had a plan and it worked! I may have taken more pics in the hours we were there than any other destination of our four week trip! I highly recommend. Overall I enjoyed the tour. On the negative side, we had only 45 minutes or so at the Viking Ship Museum - and of course with the crowds there it was almost impossible to fully enjoy this small but wonderful museum. I do not like to give negative reviews, but I have to say that our tour guide, Bjorn, interjected politics into his commentary and often made sarcastic remarks towards the USA. At one point, while commenting on the royal palace and the peaceful parade that occurs on the main street leading up to the palace, he tried to illustrate how the queen would wave, moving his hand left to right in the typical manner and compared it to how they wave in parades in the USA, whereupon he gave a not very subtle Nazi salute. I and several others in our group recognized it immediately and complained to him on the spot. This type of political commentary has no place in a tour where citizens from many countries are paying money to learn about the history and culture of the country they are visiting. I am not sure what you can do about it but if you do take this tour I sincerely hope you do not have this person guide you. The only reason this got a one star rating is because the site would not allow me to give a 0 star rating. It started out bad and got worse. We had booked this over the phone with a Viator agent as we were travelling with another couple and wanted to make sure that all the excursions we went on, we would be place together. We disembarked the ship and all the different tour buses were waiting there. We found the SPB tour operator who we were to be on the tour with. The found our friends name on the sheet a party of 2 but we were not on her list or any other lists she had. Thank goodness I was holding my confirmation in hand. After some time she attached us to the same group our friends were in. Our tour was to be led by Bjorn. Our first stop was at Vigeland Sculpture park. The park has many, many beautiful and interesting sculptures. Bjorn, for the next hour or so, had us stop at each and every statue while he gave us his interpretation of what he thought the artist was thinking. You could see by the third or fourth statue he was losing everyone on the tours interest. Now I am no art major, but give me some history on the park, some information on the artist, what the stature are made of, what the general theme is etc. . Art is very subjective. What I see may be different than what you see. Give us a little time to explore and discover ourselves. None of that time was provided. It was one statue and his opinion then on to the next statue and more of his opinion. We spent the about one third of this trip at this park. When we were leaving and on the bus Bjorn did his head count and the bus began to pull away. A few of us saw some people running toward the moving bus and recognized them from our group. It is hard to tell on the bus when everyone is seated who is there and who is not, but the tour leader should know.Fortunately we started to yell and the bus stopped in time to pick them up. On the bus we asked Bjorn if there was a bathroom at the next stop which was the Viking ship Museum. There was and we were told that there would be time provided. When we arrived it was very crowded with lots of tour buses. We were walked in and he started to tell us about the Viking ships We went quickly from room to room, then rushed off to see the short movie. When that was finished I was hoping for some time to see the artifacts and get a few photos. We had less than five minutes and it was time to leave. No where near the time to look at the historical artifacts in this building. Upon getting to the bus the bathroom question was brought up. No we would have to wait until the next stop at the opera house in 15 minutes. We arrived at the opera house. What a beautiful building it is. When we got inside those requesting a bathroom were told to go. While they were using the facilities he told us who didn't go all about the opera house. Good job I stayed so I could relate to my wife this information as she wouldn't be getting it from him. We were not allowed to see the inside of the opera house, just the lobby disappointing after some but not all had returned he started to walk up to the roof area this building is designed to be able to walk up onto the roof for a nice view of the city area Now I was a little torn on what to do. Wait for my wife Ladies bathrooms tend to be much busier than a mans bathroom or follow Bjorn. I choose to wait for my wife. It was a very fortunate that he was wearing a yellow colored hat otherwise we wouldn't have been able to find him. We located him on the roof and by the time we got there he was on the way down. Some never made it up. We went up and took some pictures figuring if the bus left we could catch a cab back. We did make it back in time and then it was on to city hall. We were given the information about the city hall and about the Pulitzer Prize ceremonies in the main hall. We then went outside and the tour was over. I have been on many tours in my life time. Many Great, some very good , some average and a few bad ones. This was perhaps the worst, or tied for the worst one I have ever been on. A good tour guide is very organized, very engaging, teaches you about what you are seeing. Gives you some history , facts and at time is entertaining. Bjorn was none of these. If he were a sports announcer calling the seventh game of the world series which is going into extra innings, he could make it boring. I definitely feel that I did not get my monies worth on this excursion. It could have been some much better with another tour guide as the sights were great to see. This was an excellent tour that did not disappoint. Our guide new her subject very well and filled our day with knowledge and a fair slice of humour. After an early problem with our motor coach, which was replaced quickly and with no inconvenience to us, the day was very smooth. Well done to all. This tour was surprising better than we had anticipated as we visited the main sites and our guide was a wealth of knowledge he had actually been on our ship prior giving a talk on Oslo the night before. Vigeland Park was a highlight which originally we hadn't even considered visiting. Our guide was also from Oslo so was able to give our group some information and suggestions for what to do and where to go after the tour as our ship was in port until late in the evening. Again, overall a better value than the tours offered through the cruise lines. Park was a little weird.. asked for a bathroom. girl didn't know where they were or the cost. Ship museum interesting. 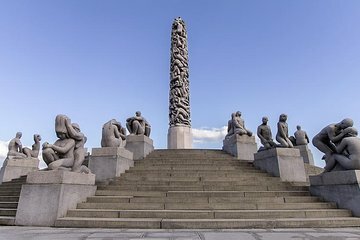 I do not recommend this tour excursion to anyone because they spent too much time at Vigeland Park which is pretty but, not to spend hours on and not enough time at the Viking Ship Museum which has a lot to see. Please tell your tour guides to spend more time at the Viking Ship Museum instead of at the Vigeland Park. I cannot remember our tour guide name, who was very knowledgeable but he was very frustrated with our excursion. I am very disappointed altogether. It is not worth for the money you pay through Viator. The two major attractions were certainly worthwhile but it should be mentioned in the description that Vigeland Park is a MAJOR trek and requires the ascension at the end of about 70 steps without railings and then a gravel path for those who have mobility issues. The Viking museum was really interesting as well. Birgitta, our guide, needs a remote microphone setup so that we could hear what she had to say outside of the bus and she moved the group along really quickly.